IT is indeed a blessing that I was able to celebrate Mothers Day with my 83-year-old mother and 89-year-old mother-in-law last Sunday. The picture shows both the octogenarians beaming with joy as their children, grandchildren and great grandchildren went home to Yong Peng to celebrate the occasion with them. For my mum, life was especially hard when she first came over with dad to Malaya in March 1947. Living in extreme poverty then, her pregnancies were often fraught with problems. She suffered three miscarriages, and two boys died one week after their births. Another girl had to be given up for adoption by the Christian missionaries at the Seremban Convent High School in 1957, whose records showed had died of pneumonia three months later. 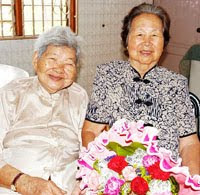 In China in 1943, her first child, a girl, was born when mum was a weak and frail 19-year-old herself. It was also in that year that our paternal grandmother died in her 40s. Believing that the newly born girl had brought bad luck to the family, our superstitious maternal grandmother decided to let her die in the cold outside. Despite all these tragedies, mum is no doubt a woman of great fortitude. While dad toiled as a farmer and labourer and was often away from home, my mum performed her duties as a mother looking after us at home. My mother-in-law is also very much an indomitable character in her own right. Hailing from China in 1932, she did not stop tapping rubber trees to support the family until she was 65. As my father-in-law (who passed away in 1980) had asthma and was unable to work, one cannot imagine how she could have brought up a family of nine girls and three boys, including a fine daughter for me to marry. Today, she has 37 grandchildren and 14 great grandchildren. She would often testify that she derives her strength from her strong faith in God, which she no doubt does as she still reads the Bible every day. I am sure many others have similar if not more powerful stories to tell about their mothers. Likewise, there are many mothers out there whose children were not able to celebrate the occasion with them as depicted by the powerful Chinese New Year advertisement of Petronas in February this year. Indeed, how we treat our parents will indirectly teach our children how they treat us later. It is often said that filial piety is becoming a thing of the past. Surely, if our children are taught the importance of filial piety when they are young, then their children will also love them in return when they grow old. To the Chinese community, filial piety or xiao means complete obedience to one’s parents or parents-in-law, and nothing can be more important than looking after your own parents when they are old. So, a tale is often told that once upon a time in China, there lived a very poor family. They had a young son but the man’s mother would always give a part of her share to her grandson so that the young boy would not starve. Fearing that his mother would starve instead, the man decided to bury his son alive. But when he dug a hole, lo and behold, he discovered a pot filled with gold. Filial piety is a universal value fundamental to the family institution. For example, my Muslim friends are often reminded of Surah Luqman (31) verse 14 in the Quran: "And We have enjoined on man to be good to his parents: In travail upon travail did his mother bear him, And in years twain was his weaning: (Hear The Command), Show gratitude to Me and to thy parents; To Me is thy final Goal." Our Christian friends, on the other hand, are often told that it is one of the Ten Commandments to honour our father and mother so that we may live long. Our parents cannot just wither away in loneliness or be treated like "excess baggage" when they grow old. It follows that our young ones should be taught, trained and imbued with filial piety as early as possible. Our primary school education system must prioritise this. In fact, the New Sunday Times reported on April 22 that Jerai Member of Parliament Datuk Paduka Badruddin Amiruldin had urged parliament to enact a law to punish errant children who abandoned their parents. The report also quoted the president of the National Council of Senior Citizens’ Organisations Malaysia, Lum Kin Tuck, responding that the proposed law was unnecessary and, if introduced, "can be a disgrace to us". Of course, it was not too nice either to read the New Straits Times on March 12 that one requires between RM1.4 million and RM2.8 million in order to retire comfortably. In Singapore, the Maintenance of Parents Act 1995 allows any person who is 60 years old or above and who is unable to maintain himself to apply to the Tribunal for the Maintenance of Parents for an order that one or more of his children pay him a monthly allowance or any other periodical payment or a lump sum for his maintenance. In India, the Maintenance and Welfare of Parents and Senior Citizens Bill 2006 was tabled to ensure that if a person responsible for the upkeep of his parents failed to take care of them, he can face up to three months’ imprisonment and a fine in addition to being disinherited from the parent’s will. To my mind, maintaining our parents is a family responsibility and not the state’s. If the state has to come in to compel our children to maintain us like what is being done in Singapore or India, then something is very wrong with our society. As a parent, to know that my children are maintaining me because of a court order only grieves me further to realise that this is retribution for I have failed as a parent all these years. It is also a damning indictment of poor parenting on our part which we, as parents, must assume full responsibility. In conclusion, let me share with you this oft-quoted inspirational lesson written by an unknown author: A frail old man went to live with his son, daughter-in-law and four-year-old grandson. The old man’s hands trembled, his eyesight was blurred and his step faltered. The family ate together at the table. But the elderly grandfather’s shaky hands and failing sight made eating difficult. Peas rolled off his spoon onto the floor. When he grasped the glass, milk spilled on the tablecloth. "We must do something about grandfather," said the son. "I’ve had enough of his spilled milk, noisy eating and food on the floor." So the husband and wife set a small table in the corner. There, grandfather ate alone while the rest of the family enjoyed dinner. Since grandfather had broken a dish or two, his food was served in a wooden bowl. When the family glanced in grandfather’s direction, sometimes he had a tear in his eye as he sat alone. Still, the only words the couple had for him were sharp admonitions when he dropped a fork or spilled food. The four-year-old watched it all in silence. One evening before supper, the father noticed his son playing with wood scraps on the floor. He asked the child sweetly, "What are you making?" Just as sweetly, the boy responded, "Oh, I am making a little bowl for you and Mama to eat your food in when I grow up." The four-year-old smiled and went back to work. The words so struck the parents that they were speechless. Then tears started to stream down their cheeks. Though no word was spoken, both knew what must be done. That evening, the husband took grandfather’s hand and gently led him back to the family table. For the remainder of his days, he ate every meal with the family. And for some reason, neither husband nor wife seemed to care any longer when a fork was dropped, milk spilled or the tablecloth soiled. Children are remarkably perceptive.